Houve um erro ao carregar as informações de lugar para o bloco selecionado. Tente novamente. Lamentamos, o seu navegador não suporta o elemento canvas. Atenção: nem todos os lugares que selecionou estão próximos uns dos outros. Para continuar a compra, clique no botão "Comprar bilhetes" abaixo. bilhetes para lugares de diferentes tipos devem ser comprados separadamente. Selecionar outro bloco de lugar irá apagar qualquer lugar selecionado atualmente. Tem a certeza que deseja ver outro bloco? "ITV call it the fastest growing sport in the World. And London will be home to a Masters tournament as of October 2019. Already in 9 countries, the World Padel Tour (WPT) brings together the best players from around the world, playing in front of growing audiences. 200,000 fans watched the WPT tournaments live last year, with a 16 million spectator reach across attendance, tv and digital platforms. One of the fastest paced games, in tandem with impossible recoveries, players climbing the court walls and big personalities. Padel delivers incredible entertainment value and will soon have the UK public cheering for one of the heroes or villains of the WPT. 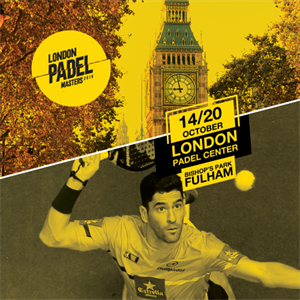 The London event will be one of the 6 highest prize money and ranking points tournaments on the professional tour which will take place at The London Padel Centre at Bishop's Park, Fulham from the 13th to the 20th of October 2019."